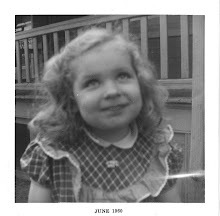 In the last couple weeks I've mentioned blogs and projects that inspire me. There are so many ways to be inspired and one of those ways is from a book. But just like blogs being so numerous, there are so many books to choose from so it is nice to know when a book meets my expectations and style. 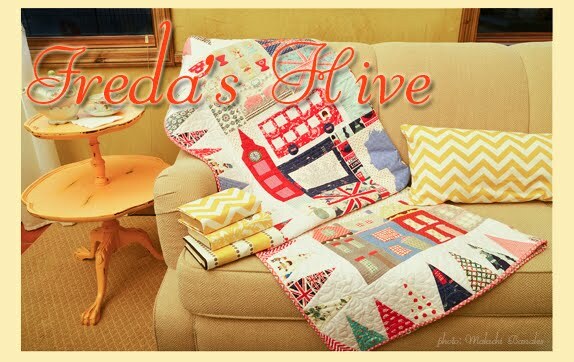 I found this book featured on Donna Flower's website. I really like the book and the vintage ideas. 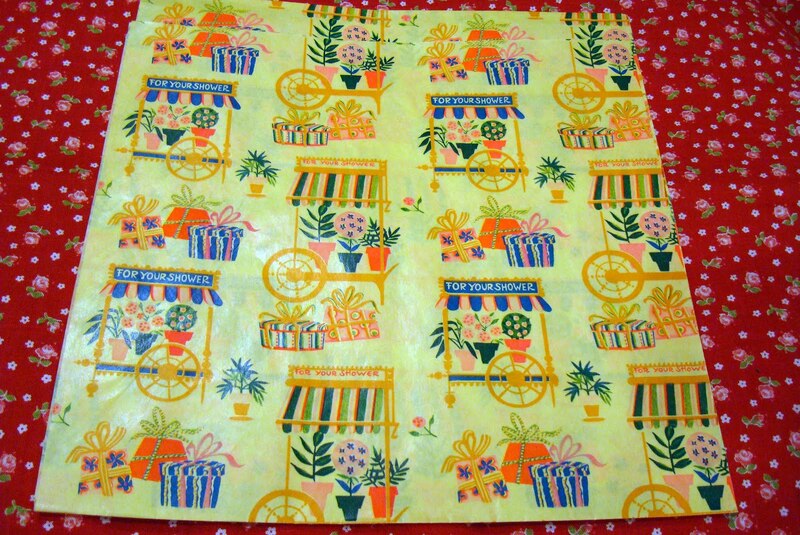 It is full of lovely ideas for vintage fabric. The front cover really caught my eye. I decided to recreate the cover project using handmade soap. 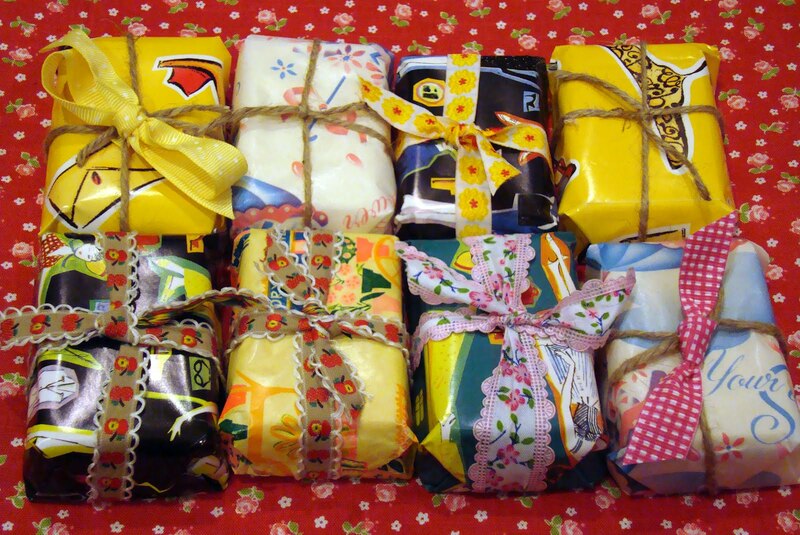 I used vintage and reproduction wrapping paper. No tape here. 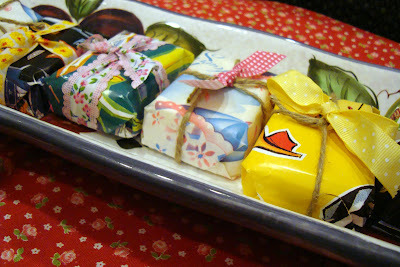 The twine and ribbon keep the soap wrapped in the pretty paper. 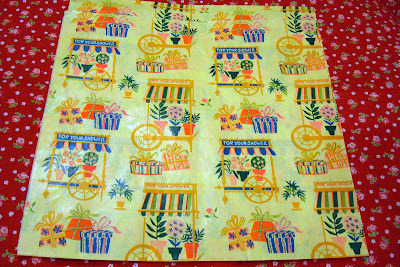 Some of the ribbon is vintage. I have to say I like the simple twine, too. So this page in the book talks about the wrapped soaps. 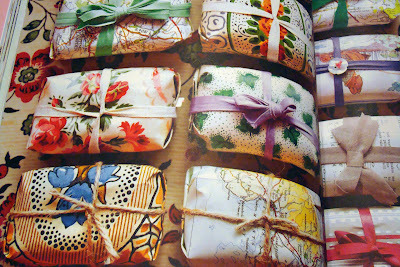 The writer keeps her soaps wrapped in old maps, vintage wallpaper and wrapping paper with pretty ribbon and twine accents. I like the one with the vintage button on top. 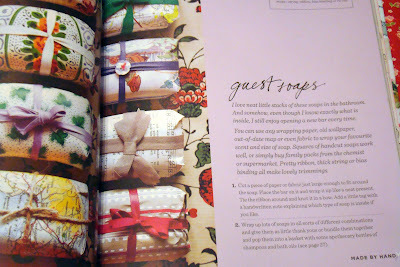 The author keeps soaps wrapped and handy for guests and friends. Everyone needs soap! It is a perfect gift. 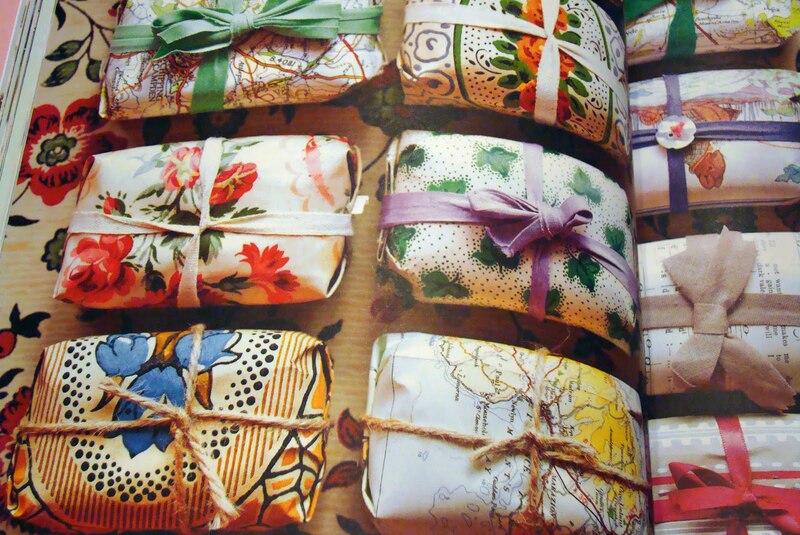 I have a very small collection of vintage wrapping paper. I liked using the paper that said "shower" on it because it may not be for a wedding shower but the soap will be used for a real shower. I thought of lots of ways to display the pretty soaps. A basket would work, of course. This tray was a perfect fit for the soap. It was a gift from my mother-in-law. I think it would be sweet to display the soap in a guest room on a tray like this. I didn't have quite the same collection of paper to use for the soap as the book, but now I'll be on the look out for old maps and old wallpaper pieces. Easter is coming and I do have eggs. I was interested to see the Easter egg ideas. I just might pick some ideas from this section. This book is a good fit for me. The photography and repurposing ideas are great. If you live by me I'd love let you read it. You're so funny - who would think to use shower paper that way. Thanks for sharing a good book! Sweet idea! I love the soaps on the tray. Check your glove box for old maps, lol! My daughter bought striped baker's twine to use to tie her wedding invites and include a mini card with the website. That would look great with the vintage paper too. SOB I wish I did live near you. So much inspiration in that book. I'll keep a lookout for it too. I love the way you've done your soaps too. Great ideas, Nanette! There's nothing like a fresh bar of soap...especially while traveling. I never thought of them as a good shower gift! We're up to our eyeballs in baby & wedding showers these days so PERFECT timing!! Fun ideas! Thanks for sharing them! Yet again another reason for me sneak away, I'll come and spend the afternoon and enjoy your book, it's only 1800 miles! It looks like a great book! 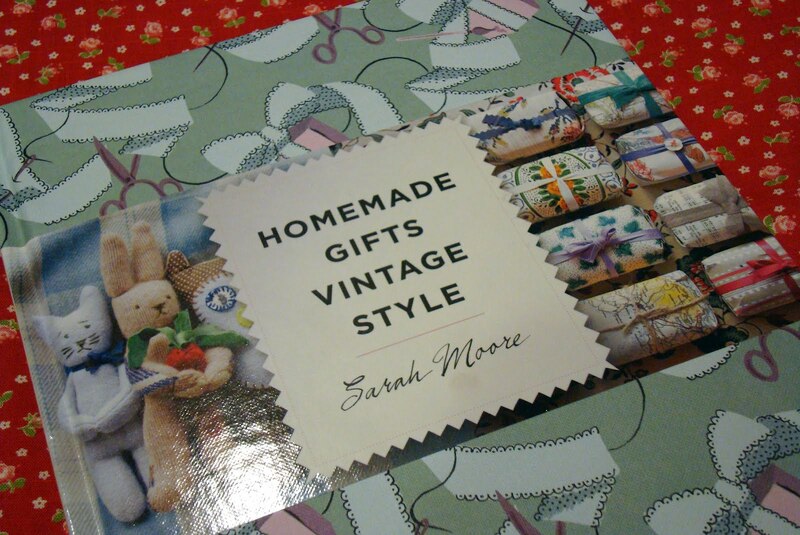 Such a great idea to make home vintage gift.I really enjoy it and i inspire from this blog.I get so many knowledge from this notes.